The illustration above shows the differences between a Track Buss, Track (Summing) Stack, and a VCA Buss. The Track Buss and Track Summing Stack look identical to each other and work basically the same way. The Track Summing Stack groups a selection of tracks under a folder (stack) so that you can process the selected tracks as a group. The VCA Buss, as you can see, has no inserts, sends or meters. It has a fader and a mute and solo button. 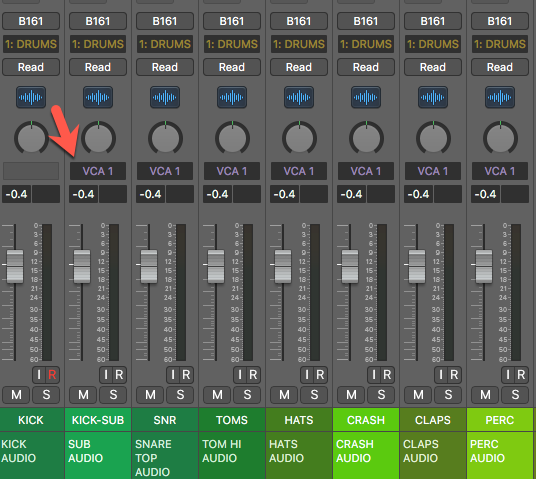 For example, I create a VCA Drum Group which includes a Kick set at -12dB, a Snare set at -11dB and Hat set at -10dB. When I lower the Drum VCA Fader by -2dB it sends the control signal out to each of the tracks above to lower their relative level by -2dB. So after this signal is sent out the Kick will be at -14dB, the Snare at -13dB and the Hat at -12dB. The VCA Drum Fader is at -2dB. So I can use one fader to change a whole group of individual faders at one time. I still have the flexibility to go in and lower just the hat another -2dB to 14dB without affecting any other channels in the group. So why not send the group of channels to an AUX track instead of using VCA Faders? If you send a group of tracks post-fader to an Aux track and lower the fader you will end up with a wetter signal because the gain has been reduced in the dry signal but not the wet signal. 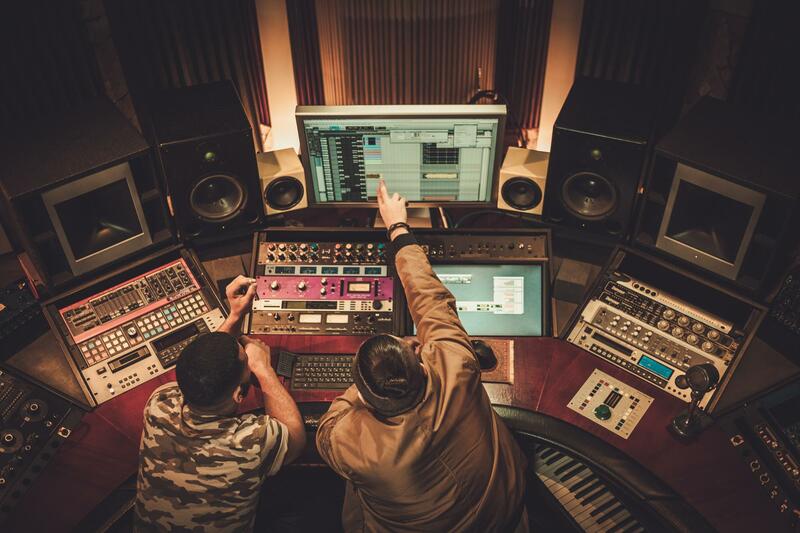 For Example, if you send one of the tracks post-fader (post-pan) to a buss (reverb, effect, etc.) it will not be under the control of the VCA Fader. Using our previous example, when you pull down the Drum VCA Fader by -2dB the channels will be reduced by -2dB but the post-fader send will not be reduced by -2dB. This isn't what we want. We want the entire signal to be reduced (wet and dry). The VCA Fader, on the other hand, reduces the gain on each channel so the amount of signal fed to the post-fader send is reduced as well and the dry/wet balance is maintained. How about using Track Stacks? The Summing Track Stack acts like a VCA on the audio signal by turning down a group of tracks but only on the dry signal, not the sends. That, also isn't what we want. We are trying to control the entire signal (sends and the dry mix) from one fader. You can use the Folder Track Stack. It functions pretty much the same as a VCA Group. It combines multiple tracks to be controlled as one unit without changing the routing of the individual tracks (just like a VCA track). 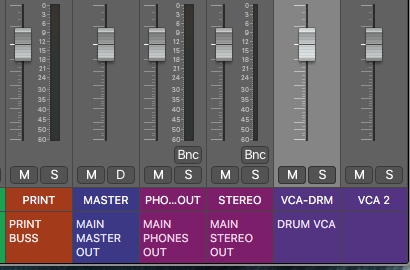 Folder Track Stacks can't be grouped into other Track Stacks or VCAs. You can create a Summing Track Stack and then put the Summing Track Stack into a Folder Track Stack. This is cool because you can use the Summing Track Stack to apply processing to the group of tracks within it and then use the Folder Track Stack as a VCA which will allow you to control the entire signal and the VCA appears. The illustration below shows the Kick VCA (Purple) including the Kick Summing Buss (Blue). There is a drawback to this approach. You can't group Folders. So if you had several Kicks with a Summing Stack grouped to a folder and all your percussion grouped to a Summing Stack grouped to a folder you can't further group the Kick Folder and Percussion Folder into a Drum Folder to control the gain of all drums. And you don't want to give up the functionality of the Summing Track Stack. This is why the VCA and VCA Groups are a better option. You can easily create VCA Groups with channels that are routed to different outputs. 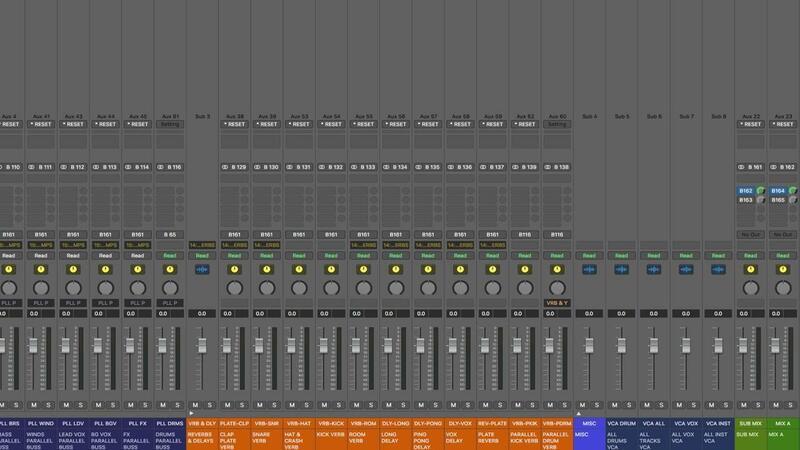 You can do this with groups and group faders. The biggest plus of using a VCA Group is VCA Groups take less CPU processing power than an AUX group, always a good thing since CPU processing power is often at a premium with big mixes. So how do you create a VCA Fader Group? 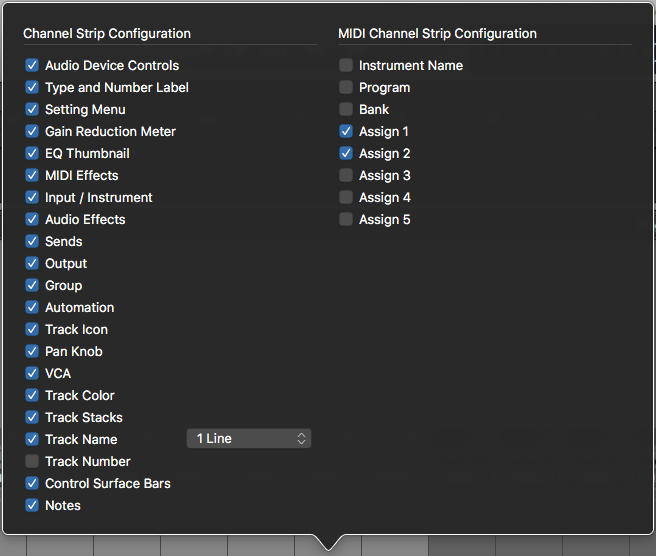 NOTE: If the VCA window isn't visible in the mixer, control-click (or right-click)on a track and select, "Configure Channel Strip Components" and select VCA. The VCA Faders are created at the very end of the mixer window beyond your Master (Stereo) Buss. Some engineers like to move the VCA Fader next to the group the fader represents (see above). What Groups Should I Create? It is in large sessions that the VCA Fader Groups really become useful. I will often create VCA Fader Groups for drums, bass (if I am using layers), synths, strings, vocals and so on. You can create as many as you like up to 256. TIP: If you are using a control surface you can create the number of VCA Fader Groups to correspond to the number of faders on your control surface for easy automation and adjustment. Hopefully, this will encourage you to use "VCA Faders" and "VCA Groups" more often. Please post any questions or suggestions for future topics in the Logic Pro X User Group.